This property is structurally sound and only needs some modernization to be made habitable. 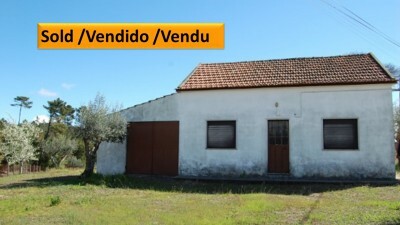 The property sits in a nice location as it is only 3 km away from the town of Ferreira do Zêzere. There is a garage to the side perfect for storage as there is already lots of off street parking. The land is all fenced and has various mature fruit trees. The house has two bedrooms, both relatively good sizes. There is also a living room and a good sized kitchen with access out to the garden. The bathroom is a also a good size but obviously needs refurbishing. Anyone looking for a holiday home or even just a small two bedroom property to enjoy their retirment, this would be the ideal opportunity. The garden is mainly flat, so easily accessible, it is close to town and it sats just on the edge of a village. The property is set in the village of Vale dos Sanchos which as mentioned earlier is only 3km from Ferreira do Zêzere. Here there are several supermarkets, restaurants, schools, sports centre and bus station. The larger town of Tomar is around 20 minutes away. Tomar is a bustling market town which boasts a variety of supermarkets, shops, cafes, restaurants, historic monuments, parks, sports centres, hospital, bus and train station and weekly Friday market. Tomar is also home to the UNESCO listed Convento do Cristo, built in the 12th century by the Knights’ Templar.